Born on 26 February 1916 in Hambach near Neustadt. After finishing school he trained to become a merchant however he became interested in aviation in 1934. Glider schools were a very popular past time in Germany in the thirties, more so than in any other European country, Clade became a member of the German National Civilian Aviators Competition which he had joined in 1931 as a hobby. Clade joined the fledgling Luftwaffe in 1936 and was initially certified to drive Junkers 52 transport aircraft before transferring to the Jagdflieger. Clade was with JG 1 during the campaign in May 1940, Belgium and France, then an Unteroffizier he was then assigned to 1./JG . He claimed his first victory in aerial combat the day after the offensive, the 11th of May, when he shot down one Gladiator of the Belgian Air Force near Maastricht in the morning, then a LeO 451 in the evening, again in the area of ​​Maastricht. Clade wins two more victories during the campaign of France, this time against a British aircraft before claiming another French victim. On the 6th of July 1940, 1./JG1 was redesignated 7./JG 27 . In March 1941, Feldwebel Clade became an instructor at the Ergänzungsgruppe JG27 . The unit was later absorbed by the Ergänzungsjagdgruppe Süd (fighter training South) . In June 1942, serving in the Mediterranean Clade Oberfeldwebel with 5./JG 27 which was based in North Africa. 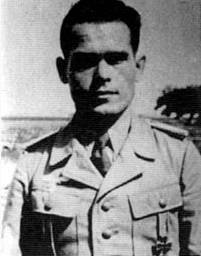 He won his tenth victory on 5th of July against a Spitfire near El-Daba. He was now an Experte. 23rd of May 1943 when a Leutnant, Clade became Staffelkapitän of 7./JG 27. He then had 17 victories to his credit. 5th of October 1943, he shot down a B-24 USAAF as his eighteenth victory. 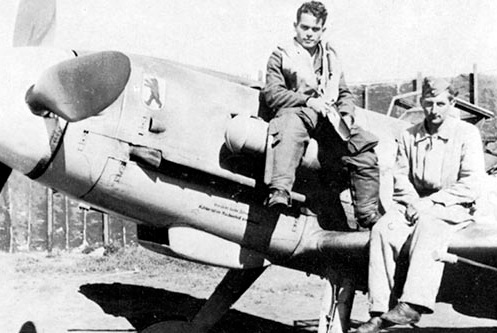 However, his aircraft was damaged and he had to abandon his Bf 109 G-6 (170 W.Nr.05). He won his twentieth victory on 13th of November 1943 when he shot down a Beaufighter fighter-bomber of the RAF in the area of ​​Levita in Greece. 20th of December 1943, he shot down a B-17 USAAF near Megara, winning his 22nd victory. A few days later he was transferred to 2./Jagdgruppe Süd , based in Avignon, France. He was seriously wounded during an attack by the resistance on the 16th of February 1944. He remained hospitalized until November 1944. When he returns to service, he returned to 7./JG 27. 26th of November 1944, Clade is again forced to abandon his aircraft, this time a Bf 109 K-4, that was damaged after an air battle. Clade became Staffelkapitän of 12./JG 27 , based in France, before the end of the month. 25th and 26th of December 1944, he claimed two Thunderbolts, winning his 23rd and 24th victories. In February 1945, Oberleutnant Clade became Gruppenkommandeur of III. / JG 27 (Acting). The unit is based in Germany and carriesd out missions of homeland defense. His last air combat takes place on the 25th of February when he shot down a P-38 USAAF however, his own aircraft was seriously damaged and he was forced to bail out. Hauptmann Clade and Major Peter Werfft (26 victories, RK), where responsible for the dissolution of III. / JG 27 in Saalbach on the 3rd of May 1945 when Clade became Gruppenkommandeur of I. / JG 27. Most men of the unit took refuge in the mountains before surrendering or being captured by the Americans. Clade survived in various minor jobs after his release from a prisoner of war camp. 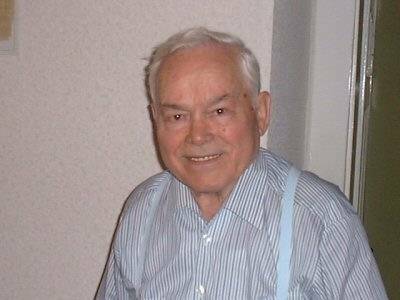 He applied to become a civilian pilot with the newly formed Lufthansa in 1956 but was turned down because he exceeded the age limit by two years. However, he continued as a private aviator, was successful in various German competitions, and helped setting up local aviation associations. He died in 2010, at the age of 94. Very interestig indded. he was wounded by the resistance where i live now.Not found any precisions about that at the moment.